I often speak about the power of the crowd to drive impact. Whether its creating Wikipedia, predicting protein folding, or solving XPRIZE Competitions. There is a massive amount of “cognitive surplus” available to do good in the world. Normally we ask the crowd to SOLVE our XPRIZEs… this time, we’re asking you to design them as well. Can you write the rules for our next XPRIZE competitions better than our internal team? Or external experts? Why do this? Well, there’s up to $100,000 in prizes and awards, but more importantly you get to help shape the future. PLUS, you’ll be invited to join along-side our Innovation Board and Vision Circle members (aka our largest benefactors) and participate in our 2018 VISIONEERING Summit this October. I hope you’re up to it. And if you’re not, would you mind doing me a favor and POST this on your social media, or forward this to a friend who you think might have interest? We’ve partnered with the crowdsourcing platform HeroX to source hundreds of designs from all across the world on our five chosen topics. Your first step in participating is clicking here: 2018 Visioneering Prize-Design Challenge. Learn the background on these five prize topics. You’ll also have the option to view a brief “Master Class” video that I recorded on designing an XPRIZE. One of the MOST Powerful and enjoyable chapter of my life was designing the Suborbital Flight XPRIZE (later to be called the $10M Ansari XPRIZE). After the prize was launched, it attracted 26 teams from 7 countries who spent $100 million to win the $10M competition. Writing the rules and announcing the competition lead, step-by-step, to the creation of the Private Spaceflight industry. What do you care about? If you write a winning set of prize rules, you could make your vision of the future a reality as well. Again, if you aren’t motivated to form a team to compete. Would you send out a tweet? Here’s a draft for you… and/or forward to your friends & family! Crowdsourced innovation is about finding the best ideas that exist, regardless of their origin. When we limit innovation to ideas generated within the four walls of our organizations, we might be able to find a “local maximum” of ideation (i.e. a ‘good-enough’ idea). But even if you have the best and brightest in the room, you’re still leaving opportunity on the table. 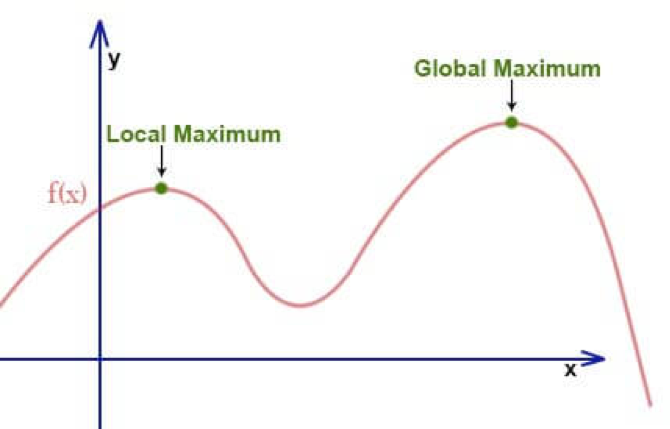 (Chart depicting local vs. global maximum. By opening innovation up to the crowd, you can come closer to finding the “absolute maximum” – the best possible XPRIZE Design. Experimentation, passion and grit are critical concepts for exponential entrepreneurs. We must constantly look for ways to transform and reinvent business models. PPS. Send out a Tweet or post on FB for us. Help us see if this experiment will work. I would be VERY Grateful!! !